When reactors or pipelines are located in extremely hot or cold conditions, they must be insulated in order to keep the process media within an optimal temperature range. This insulation, however, makes it time-consuming and expensive for operators to replace a thermocouple or RTD temperature sensor on the vessel’s surface. WIKA’s innovative “Ski Slope” holder allows a technician to quickly and easily replace a nonworking sensor without having to disturb the insulation layer. When pipelines and vessels are located in extremely cold environments, several layers of insulation cover the surface area to keep the fluid inside within an optimal temperature range. Heat tracing and steam tracing also keep process media warm and flowing, and those lines are located underneath the insulation as well. In reactor furnaces, the insulation minimizes heat loss and maintains efficiency. To properly measure skin temperature, the thermocouple or RTD sensor must also be mounted under those layers of insulation. In a standard temperature measurement solution, the entire assembly is mounted parallel to the surface and “buried” underneath insulation. This is not an issue – as long as the sensor is working properly and does not require maintenance. However, even the most robust RTDs or thermocouples fail over time, and replacing them is a time-consuming and disruptive process because of the insulation. Several technicians must remove the insulating layers, unmount the old sensor, install a new sensor, and put the insulation back in place. Sometimes there is cladding to remove and reinstall as well. The financial costs of downtime and labor are considerable. 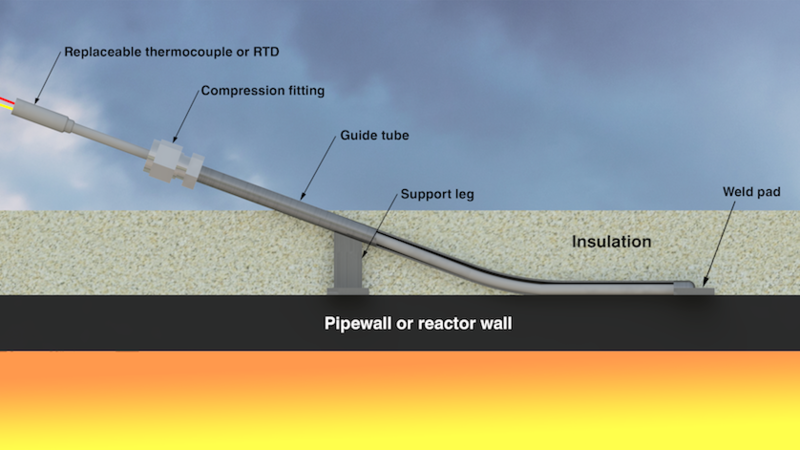 For insulated reactors and pipelines, WIKA has designed an innovative ski slope holder (Model Tx54-S). This surface temperature measuring instrument minimizes the time, personnel, and, therefore, the expenses involved in replacing a failed thermocouple or RTD. The temperature sensor itself is underneath the insulation, but the extension of the assembly rises away from the surface and protrudes out of the insulating layer. The device slopes like the ramp used in ski jumping – thus its name. The holder, usually made of stainless steel, has a guide tube (also called an extension tube) inside and a pad attached to one end to hold the thermocouple or RTD temperature sensor in place. The pad is either welded (preferable) or strapped to the surface, and it transfers the skin temperature to the thermocouple or RTD tucked inside the pad. Whether welded or strapped on, the pad makes good, continuous parallel contact with the surface, allowing very accurate measurements of the skin temperature. The holder’s slope can be either straight or gently curved, depending on the orientation of the piping or structure it is attached to. A support leg gives the ski slope extra stability. The extension tube exits out of the insulation, making the sensor easily accessible. To change the thermocouple or RTD, just loosen the compression fitting that holds the sensor in place. Slide out the nonfunctioning sensor, insert a new one, tighten the compression fitting, and that’s it. No need to touch the insulation. No need to call in specialized personnel. No extra expenses besides the cost of the thermocouple or RTD temperature sensor. WIKA’s replaceable skin temperature sensors are a robust, accurate, and hassle-free solution for all applications. Users of these temperature measuring instruments enjoy flexible installation, easier maintenance, lower costs, and – most important of all – the ability to accurately monitor temperature in a variety of extreme conditions, ranging from hot spots on furnace tubes to pipewells above the Arctic Circle. For more information about the ski slope design and other temperature measurement solutions, contact WIKA today.